For the last 6 years, Denrele has been paying tributes to Late Goldie since she sadly passé don in 2013 on a val’s day. 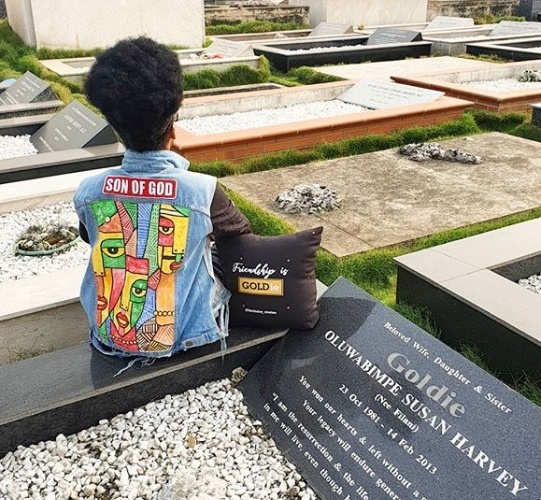 Today, Denrele took it a step further, went to her grave and reminded her of how great their friendship was and how she has truly been missed. 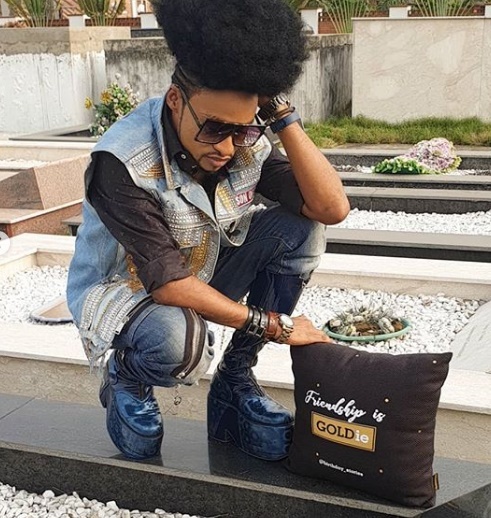 Though many of her colleagues have forgotten her, Denrele still keeps her memory very fresh with us. More photos and what his tribute below… RIP GOLDIE! ''I wonder what u were thinking as ur life ended. Did you wonder if ur life mattered? Then let me tell u that it did. That in those few days together u touched my heart with your kindness, ur laughter, ur positive energy. And above all else with ur beautiful, beautiful smile. As u were dying, did u wonder if people would remember u? Then let me tell u that I will remember u forever & hold you close in my heart. I wake after a night of crying, a day of loss, & I have one moment…one beautiful, solitary moment when everything is right in the world because THAT is the moment before the moment when reality crashes into me like one of those displaced trailers in the wrong lane speeding! And Im suddenly awake & without air. I started to write about her ystdy, but found myself at such a loss. For 36 hours, I’ve been struggling to find the right words to describe my friend – to tell you about her, to explain why this loss is so tragic. And, I can’t seem to find them. Any death of someone so young is a tremendous loss, I know. When I last wrote about GOLDIE, it inspired music from someone. That’s the kind of soul stirring she motivated. For me GOLDIE was a fiery spark full of love & determination. She was beautiful, smart, challenging, empathetic & encouraging. She always looked to grow; to better herself as a person and a professional. She was aware & spiritual - A great listener with time for friends from al walks of life. She was as selfless as she was determined & left her mark on so many ppl. Goodbye my friend. I hope that wherever u are, u finally hv peace in ur heart & soul.